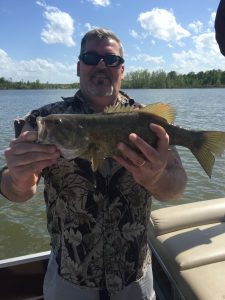 Branson Fishing Guide Service a full service fishing charter where we supply’s the great outdoors with all of the comforts and fun! 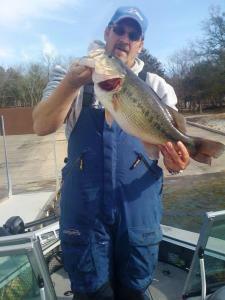 Branson’s Only Full time Pontoon Fishing Charter Service on Table Rock Lake and Lake Taneycomo! Our Pontoon is setup for our Large Families with small children! USCG Capt. Don House owner of Branson Fishing Guide Service welcomes you to Lake Taneycomo and Table Rock Lake in Branson Missouri! We hope you are ready to relax on your guided fishing trip and enjoy a beautiful day on the water in Branson Missouri! BFGS is a Multi Species Fishing Guide Service and the only Fishing Guide Service with a Fully Rigged Tri-Tune Pontoon for our clients from 1 guided person to large groups and families up to 6 persons guide service year around on Lake Taneycomo and Table Rock Lake. We are here to give you the best fishing that the Branson Missouri area lakes and rivers have to offer with the most comfort we can possibly show you! 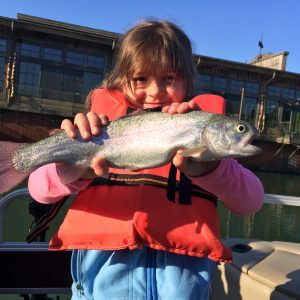 Branson Fishing Guide Service offers a complete professional guided fishing trip for everyone from the beginners and families all the way to the seasoned tournament pro! So come learn a new type of fishing and bring the Wife and the Kids! Lets go fishing! Branson Fishing Guide Service can offer one guide or 10 guides to cover all size of groups and companies events. 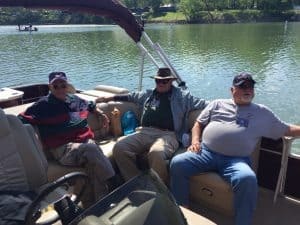 With over 20 years of tournament fishing and guiding experience I can teach you all of the tricks and techniques to fishing deep clear waters of Table Rock Lake and the cold clear Trout waters of Lake Taneycomo in complete comfort with our larger pontoon guide boat within a short cast of Branson Missouri. Table Rock Lake offers has some of the best deep clear water fishing in the United States rated one of the top 10 lakes in the US for Deep Water Bass of all types, like Largemouth, Small Mouth, Spotted Bass, Mean Mouth, White Bass with the use of artificial baits and live bait. Table Rock Lake Bass Fishing is year round from early to late Winter A-Rig fishing to Mid-March for our pre-spawn stickbait fishing, April for our spawn.May for our post spawn topwater fishing and great Small Mouth Bass fishing and June through December for our deep water fishing bite, families can enjoy the summer deep water drop shot fishing with live bait for Bass the whole family can have fun catching our spotted bass in deep water! Table Rock Lake also offers some of the best seasonal Spoonbill Snagging for the strong of heart and arms spoonbill fishing (opens March 15th) for a chance to snag that 100 pound spoonbill up the James River, to a great White Bass bite in Spring on topwater and Summer on spoons. Best for families or customers that just want to catch alot of fish and have a fun day in total comfort! We will fish from Up river if needed towards Short Creek and all the way down the river toward Branson Landing Area. 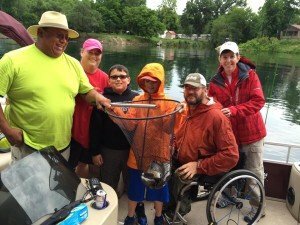 Taneycomo Lake offers the whole family a great chance to catch fish all year round. You are allowed by State of Missouri with your licenses to keep 4 Rainbow Trout of any size for eating, so BFGS will clean and package your catch so you can return and have that fresh Rainbow Trout dinner that evening! So book that day for yourself or bring the whole family out fishing for the day. Call us (417)-270-7157 to book that trip, we will do the rest. In 2019 on Table Rock Lake and Lake Taneycomo we will offer our Pontoon Fishing Guide service. On one of our Guided Trip “WE DO NOT” charge you an extra charge for live bait and I do not charge you if the wife or Grandma wants to tag along and read a book, that is FREE! Here is something new for Branson Fishing Guide Service on Lake Taneycomo Table Rock Lake, we are going to add to our list of tours a new 2 HOUR Guided Trip on Lake Taneycomo for all of our families who want to enjoy fishing but know the kids can only stay in one place for 2 hours not 4 hours! We have that covered as well! Even if you are just in town for a day or so and want to just get out by yourself I can help you out! Branson Fishing Guide Service on Lake Taneycomo Table Rock Lake is now has the only full time fishing tri-tune pontoon on Lake Taneycomo and Table Rock Lake this is a boat for everyone and has everything needed for our fishing trip from all new equipment to state of the art fishing electronics and high performance trolling motor to handle even the big waves! I guide everyone from a single person to large families and Corporate Groups up to 6 are welcome to fish in the comfort of BFGS SunCatcher Tri-Tune Pontoon! Let’s talk about our Pontoon she is a G3 X322FC Guided Fishing Tri-Tune Pontoon with extra room for kicking back or extra room just for your fishing enjoyment! Our fishing Pontoon is very Handicapped friendly for folks in wheel chairs. Our Pontoon has Four custom sit down fishing seats, full couch and table which most covered from the sun, plus a sun bed couch for those who like to just hang out! Branson Fishing Guide Service is the only guide service that “DOES NOT” charge a fee for Mom or Grandma who just wants to watch and are not fishing, they are welcome to go for free! 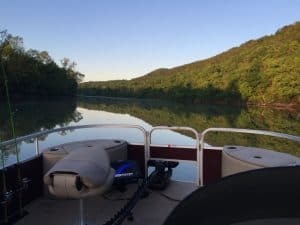 At Branson Fishing Guide Service it’s more than just a Pontoon Boat it a Bass Boat hiding as a total tricked out but comfortable pontoon fishing machine needed for that fun day on the water for everyone. <>< Just give us a call anytime for your fishing needs on both lakes Table Rock Lake and Lake Taneycomo when your here on Vacation in Branson Missouri, even if you only want some basic information on fishing, lodging information. <>< Branson Fishing Guide Service with Capt. Don offers all types of Guided Fishing Trips from 2, 4, 6 and 8 hour trips from 1 to 6 persons. 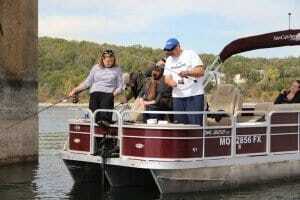 Pontoon Fishing Guide Service in Branson Missouri for all sizes and types of groups, Large Families? Now everyone can go! Just for you to have a relaxing fishing trip of a lifetime. <>< Call BFGS and ask for Capt. Don at the numbers listed below or drop him an email to book that professionally guided fishing trip and a relaxing day on the water and let’s go fishing! <>< Hire Capt. Don for your speaking guest and seminars speaker. Capt. 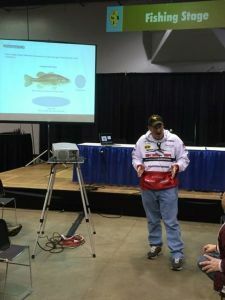 Don specializes in teaching the “how to” of Deep Water Fishing and Electronics use and understanding!